Ciao Bambini! - Hello Children! My Nonna Romana used to say this to me every year on the eve of La Befana! 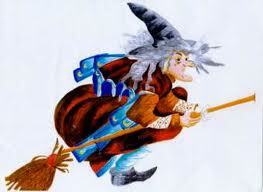 So today is La Befana, and if you aren’t Italian you probably have no idea what I'm talking about. So let me give you a brief history. La Befana is an old woman who delivers gifts to children throughout Italy on Epiphany Eve (the night of January 5th) in a similar way to Santa Claus. However, instead of using reindeers to get around, she uses an old broom. This Italian gift-giving spirit is also known as La Vecchia (the Old Woman) or La Strega (the Good Witch). In popular folklore, la Befana visits all the children of Italy on the eve of the Feast of the Epiphany to fill their socks with candy and presents if they are good or a lump of coal or dark candy if they are bad. Being a good housekeeper, many say she will sweep the floor before she leaves. The child's family typically leaves a small glass of wine and a plate with a few morsels of food, often regional or local, for La Befana to restore herself. Christian legend had it that La Befana was approached by the biblical Magi, also known as the Three Wise Men (or the three kings) a few days before the birth of the Infant Jesus. They asked for directions to where the Son of God was, as they had seen his star in the sky, but she did not know. She provided them with shelter for a night, as she was considered the best housekeeper in the village, with the most pleasant home. The Magi invited her to join them on the journey to find the baby Jesus, but she declined, stating she was too busy with her housework. Later, La Befana had a change of heart and tried to search out the Magi and Jesus. That night she was not able to find them, so to this day, La Befana is searching for the little baby. She leaves all the good children toys and candy (Caramelle) or fruit, while the bad children get coal (Carbone), onions or garlic. I confess that growing up I didn’t exactly know who La Befana was or why she was special in any way. Truth be told, my parents always told me she was Santa Clause's distant relative and I wasn’t in a position to argue with them after they told me I would be lucky to be getting anything that year, even a lump of coal. Well much to my surprise I awoke the next morning to find something that looked just like COAL... with an odd licorice scent. As I examined my "gift" from La Befana closer I found that what I thought was coal was actually a marshmallow dipped in black licorice!! A brilliant scheme to trick me, but you have to be kidding yourself if you think that I was going to accept such disrespect from La Befana. I marched up to my Papino Vito, who the night before implored me to leave a glass of Limoncello and some of those Taralli that Nonna makes for La Befana. His story was that she needed to regain her strength after coming all the way down our chimney (My family lived in Brooklyn at the time and we had no chimney at all. I suppose my father was referring to the radiator pipes.) to leave presents for us, AND sweep the floor before she left. Santa's leftover milk and cookies wasn’t going to cut it. Apparently La Befana had developed a taste for cordials over the years that I knew nothing about. In the end, Papino Vito, copped to acting as La Befana's assistant the night before. He told me that she said that I had been a good girl, but she was just making sure that I would STAY that way for the rest of the year... then Papino Vito shelled out the real candy and all was well with the world! Not before he reminded me that when he was a little boy in Italy, even if he was good all year, all he got was an orange… clearly times have changed. In any case, its really not a bad deal this whole Befana thing. She's a sweet old lady who flies around going down chimney's and leaving kids presents. She'll even sweep the floor before she leaves. And all she asks for is a stiff drink! Now I don’t know about you, but I have relatives who aren't as considerate (just kidding!). This has to be one of my favorite Italian traditions, and I'll never forget my Marshmallow Coals!